Are you suffering from poor ISP DNS service? Or your ISP's DNS servers are always down? Opendns!! Let's try it! It's free DNS service provided by opendns.com. 1) It’s safer for you to do web surfing!! 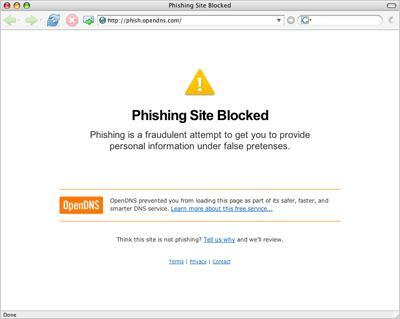 There is anti-phishing feature that would block you from accessing those phishing sites. The phishing site is a fake site that built to steal your personal information or money. You would receive following warning page when you try to surf a phishing site. 2) Improve your web surfing speed since they keep real big DNS caches and also have good DNS caches network. 3) Correct spelling mistakes on-the-fly when you do web surfing. For example, yahoo.co would be corrected as yahoo.com. If the DNS service fails to correct the spelling or the domain does not exist, it would display a search page with some pretty near result. How to set it up? It’s very simple! What you need to do is to change your DNS servers information on your computer or router to 208.67.222.222 and 208.67.220.220. Here is the screen shot on changing the DNS setting in Windows 8. Not too sure on how to go to above TCP/IP properties page? 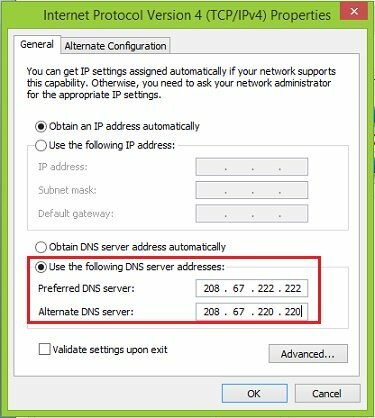 Check out these articles on how to set opendns information in Windows 10, Windows 8, Windows 7, Vista or XP. Once you have done the DNS setting change, don't forget to open a command prompt as administrator and flush the DNS cache as shown below in order to start using new DNS servers.